It’s all too easy for shoes and boots to mark or scratch a car’s sills as passengers and drivers get in and out of the vehicle. And when you think about how many times this is going to happen over the lifetime of a car, it’s inevitable that the wear and tear is soon going to start to show. However, with a full set of Travall SillGuards fitted to your car, you’ll have outstanding protection for relatively little cost. You could even be saving money by not having to pay for expensive repairs on an area that’s always going to be susceptible to damage. It really couldn’t be easier to fit Travall SillGuards. Installation is quick too. In most cases, you can certainly get the job done in under 20 minutes. All you have to do is peel off the covering layer on the double-sided tape attached to the guards and then stick them on to sills which have been washed, dried and degreased with the handy cloth which comes with every order. 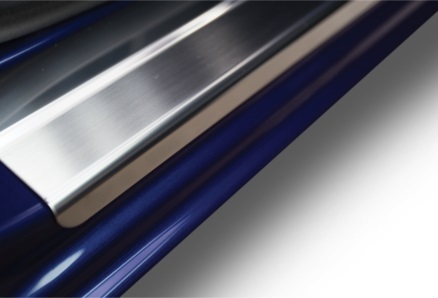 As the tape we use is of automotive quality and made by leading producer, 3M™, it is super strong and will ensure the sill guards stay firmly in place. So, unlike some guards, ours require no drilling at all. Travall SillGuards have another big advantage over many similar guards readily available online or in your local accessory superstore. It is that they have been designed and expertly manufactured specifically for the make and model of car you drive. This means they will blend in seamlessly with the car’s interior. So, as well as perfect protection, you’ll be getting a perfect fit. Ours are thicker than most other sill guards too, which are typically between 0.5 and 0.7mm thick. 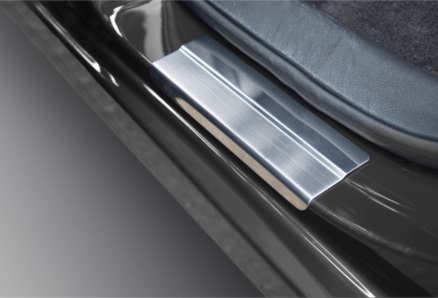 As the high-grade stainless steel we use for Travall SillGuards has a thickness of 1mm, they are far more capable of sustaining any heavy knocks without denting.